But that’s not entirely true. 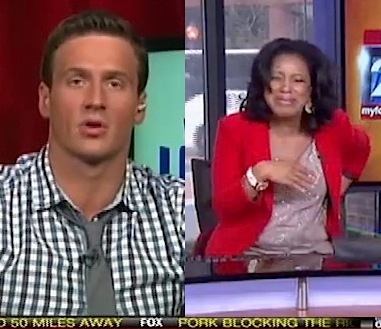 The notion of him being a complex person that we need to “get to know better” created a magical moment that had Philly news anchors Sheinelle Jones and Mike Jerrick laughing to the point of nearly peeing themselves. After being asked what kind of line a woman would have to spout to get his attention, he lost his train of thought, continuing to make us wonder if English is in fact his first language. “My philosophy is if you’re a man at night then you gotta be a man in the morning,” he said. His eventual explanation of what a bathroom is (“There’s like a, mirror, with a sink…”) proved to be too much for Jerrick and Jones, whose laughter-induced tears could have filled a 15,000 gallon pool.